The Better Business Bureau is warning users of Venmo not to make transactions with people they don't trust. The Better Business Bureau is issuing a warning after some users of the popular money transferring app Venmo say they were scammed out of thousands of dollars. Venmo is a digital wallet app that links to a credit card or bank account and lets users easily send or receive payments. Some users, like Alex Wilburn, say they got digitally burned using it to sell items to strangers — something for which Venmo says the app was not designed. "This person was very eager to buy my car and I met him at the mall," said Wilburn. Wilburn says the buyer, who responded to his Craigslist ad for his 2001 Acura, sent him $1,800 via the Venmo app. "The way Venmo works is if somebody transfers you money, you see it in your account and you think it's there to stay," said Wilburn. "I signed the title over, drove back to my apartment, and actually helped him replace the tags and then he drove off." But 12 hours later, Wilburn says he got an email from Venmo, saying the payment had been stopped and then he saw the money out of the Venmo account reversed and sent back. "I couldn't believe it," said Wilburn. Venmo spokesperson Josh Criscoe says there is no buyer or seller protection and that the app is designed for payments between friends and people who trust each other. The app's user agreement also says personal accounts may not be used to receive business commercial or merchant transactions. Criscoe added any business usage of Venmo requires an application and explicit authorization. Venmo says it recently implemented alerts within the app designed to protect users and discourage activity that violates our user agreement. The Better Business Bureau recently posted a warning about scammers using Venmo. They say anyone using the app should treat it like a check. "These apps are really breeding grounds for these scammers," said Kelsey Owen with the Better Business Bureau. 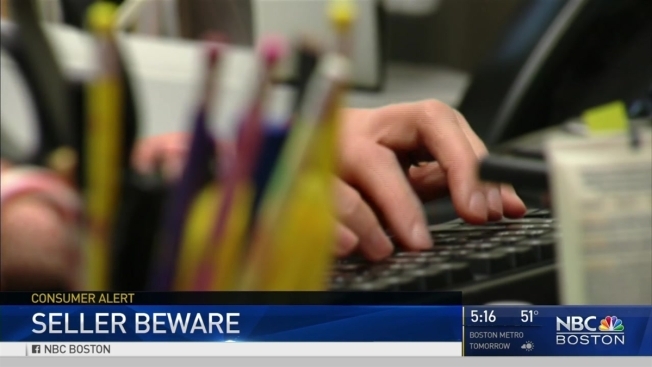 "These scammers find something that's popular and they're going to try to work it. You need to remember that there is that delay. There's those days in between when the transaction was put in and when they're taking that money from the buyers account and putting it into yours." The BBB advises users to limit transactions to people they can trust. "Not even just people that you've met," said Owen. "People that you know that are going to be good for the money." Venmo users are advised by the BBB to link their accounts to credit cards instead of bank accounts so they have some protection, to use the app only with people they trust, and to check the account after transactions to make sure money has been transferred.